Meet Donna Macleod (Inverness), winner on Friday of the British policewomen's golf championship over the Moray Golf Club Old and New courses at Lossiemouth. Former Scottish women's amateur champion Alison Gemmill was runner-up. The third PSUK (Police Sport UK) British Women's Golf Championships were held at Moray Golf Club on Friday. This was the first year the tournament was organised and run by a commitee comprising representatives from forces across the country (including myself) and chaired by Maureen Brown, Assistant Chief Constable of Central Scotland Police. Prior to this the tournament was begun by officers from Essex who felt that the ladies and not just the men should have a British championship! In 2005 and 2006 it was held at the Five Lakes resort, Essex. 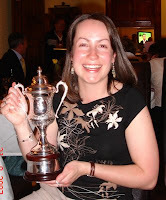 Incidentally I was third scratch in 2005 and runner-up in 2006, both times to Alison Gemmill of Strathclyde Police. You will know her as an ex-international player and a former Scottish women's amateur champion. She plays off one.This year we changed the format from one medal round to two, played on both the Old and New Course at Lossiemouth. We had a Scratch division, 0-20 handicap and 21-36 handicap section to give ladies of all standards a chance to play. Competition was good, handicaps including Alison off one, Bethan Jones (north Wales) off two, Linda Allan (Strathclyde) off four, and a cluster on five, six and nine handicaps.Conditions were tough on the day with a very strong wind and drizzle in the morning. I played the New Course first and shot 76 (halves of 41 and 35, one under on back nine) - 6, net 70. The CSS rose to 73 so I have managed to cut my handicap to 5 again! I was four shots ahead after the morning. The wind got even stronger in the afternoon and I struggled off the tee. I ended up shooting 86. Not so bad really, given the CSS went up to 79! Thankfully, it was enough and I won with an aggregate of 162 by two shots from Alison Gemmill (80, 84). Third scratch was Linda Allan - all Scots!In total we had 34 players, an increase from last year, forces ranging from my own Northern Constabulary to Devon and Cornwall. Next year we are travelling to Fairhaven Golf Club, Lytham St Anne's in Lancashire. The ladies found Moray tough but had a great time and had nothing but good things to say about the club, members etcAs for me, I am still a member at Inverness Golf Club. I'm 27 and have been in the Force for seven years, now currently based in Inverness. Previously served in Glencoe and Fort William. I am the shift traffic officer/response driver.On Sunday I am off to Ayrshire for the Scottish Police championships (men and women) to be played at Irvine Bogside and West Kilbride on September 4 and 5. As there are fewer ladies in this event (normally 10 to 15) it is a handicap competition, so slightly more difficult to win - but fingers crossed!I will be back to work eventually! Haven't played much since I hurt my back at Cruden Bay on the first morning of the North Division jamboree and with work commitments so this was a huge achievement for me.